Roz Savage was named a National Geographic Adventurer of the Year in 2010 after completing her voyage across the Pacific. Her hands blistered, her body fatigued and her mind numbed by the steady lapping of the sea against the side of her 23-foot boat, Roz Savage was wracked with self-doubt as she made an unaccompanied 3,000-mile voyage from the Canary Islands to the West Indies. At night, as she attempted to sleep, the sea tossed her boat around violently; torrents of water rushed through the ventilation holes; soaking her bunk; and the only light that could be seen for miles was that of her own head lamp. All four of her oars were snapped or bent, her cooking stove was broken and her watermakers were on the fritz. The then-36-year-old corporate consultant from the suburbs had ended her marriage and plunged her savings into an ocean rowboat. Here she was, the first solo woman ever to enter the great Atlantic Rowing Race, and 26 other crews had capsized or sunk. A self-described bookworm growing up, Roz Savage might have been the last person you'd expect to blossom into a great adventurer. 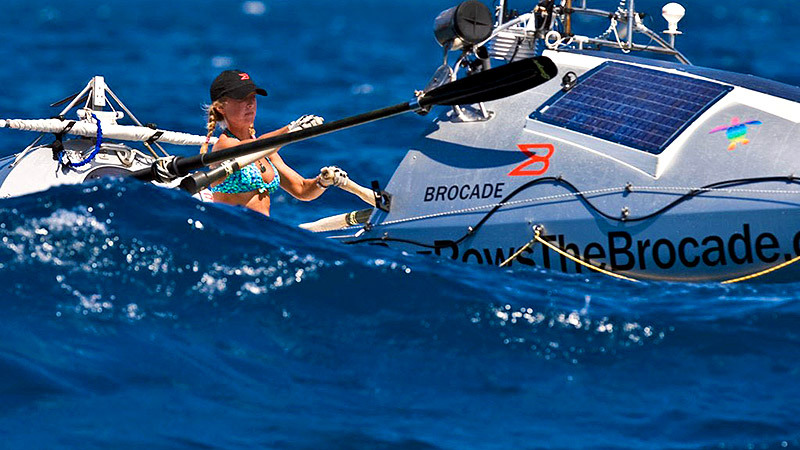 Now 45, she's the first woman to have rowed solo across the Atlantic, Pacific and Indian oceans, in an effort to reroute a life that had followed an unsatisfying linear path. Having lived to write about it, Savage's latest book, "Stop Drifting, Start Rowing: One Woman's Search for Happiness and Meaning Alone on the Pacific," dropped last week, offering insights into her crossing of the Pacific Ocean, as well as her environmental activism along the way. Before rowing more than 15,000 miles and battling 20-foot waves, sharks and dehydration, she worked as a management consultant in London. The money was good, good enough to buy her a house in the suburbs and a little red sports car. In her early 30s, however, the sheen of money and materialism began to dull. She sat down and wrote two versions of her obituary -- one that portrayed the life she had and the other the life she wanted. The discrepancies were glaring. Roz Savage says going solo prevents her from pawning off the jobs she'd rather not do herself. "It was one of the most crucial moments of my life, but I didn't immediately have the courage to act on it," Savage said. "I found, however, that once you have that kind of knowledge, you can't pretend you don't know." In 2003, at age 35, she dipped her toes into a different life, taking a three-month trip to Peru, traveling and accompanying an archeological expedition. She finally felt she was on the right track, but she needed something more challenging and epic -- something so mentally and physically grueling that she could complete her evolution from corporate cube dweller to roaming explorer. "Growing up I was terrible in physical education in school, and rowing was the only sport I had ever done, and I had very happy memories doing it in college," she said. "Then I made friends with a guy who rowed across the Atlantic with his mother and these ideas collided." It was that spark of inspiration, combined with a newfound devotion to environmental activism, that led to her first ocean crossing. Spending 16 hours a day on the rowing machine, she prepared the best way she knew how. "The thing about sea voyage is it isn't like running a marathon, and it's not like going to the gym and lifting heavy weights for an hour," she said. "It becomes a lifestyle." Setting off with a naive optimism onto the open sea, those 3,000 miles pushed her beyond her limits and back, inspiring her first book, "Rowing the Atlantic: Lessons Learned on the Open Ocean." 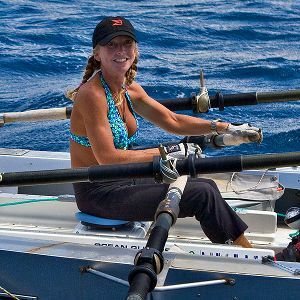 While that book covered her transition from office worker to ocean adventurer, her latest volume starts with her failed attempt to row the Pacific in 2007. After encountering 14-foot-high seas and 40 mph winds, which tossed her from her sleeping bunk headfirst into the wall of the boat's cabin, as well as widespread equipment failure, the U.S. Coast Guard airlifted her off her boat 10 days and 90 miles from California's coast. Subsequently, "Stop Drifting, Start Rowing" chronicles her second successful effort one year later, a three-stage Pacific voyage that took 300 days to cover 8,000 miles from Sausalito, Calif., to Madang, Papua New Guinea. The book also delivers environmental messages about everything from plastic pollution to rising sea levels. "I'm actually much more excited about this second book," she said. It's clear that Savage, who blasted out the volume in just 16 days, does nothing halfway. Having once found herself trapped on the wrong track, she now approaches life with a deliberate, focused intensity that is characteristic of elite athletes and committed adventurers. She contends this is simply a result of setting a goal and working to achieve it. "I had a clear vision of where I wanted to end up -- of riding into that port and taking that first hot shower and having that first cold drink," she said. "You have to ask yourself, 'What can I do today to get closer to that?' Don't think about everything that can go wrong between today and your goal. The winds and currents may push you off course, but you keep adjusting and you'll get there, just probably not in a straight line." With her latest book and a devoted following of fans, next up for Savage is a possible feature film about her life. "It's an exciting prospect, especially if it helps convey some of these messages about what we are capable of when we prioritize happiness and meaning above materialism, in addition to the environmental messages," she said. "I may just be like the Erin Brockovich of the ocean."